Strontia Springs Dam is 6.5 miles upstream of the mouth of Waterton Canyon on the South Platte River. Water is diverted from the reservoir into a 3.4-mile tunnel under the mountains to the Foothills Water Treatment Plant. 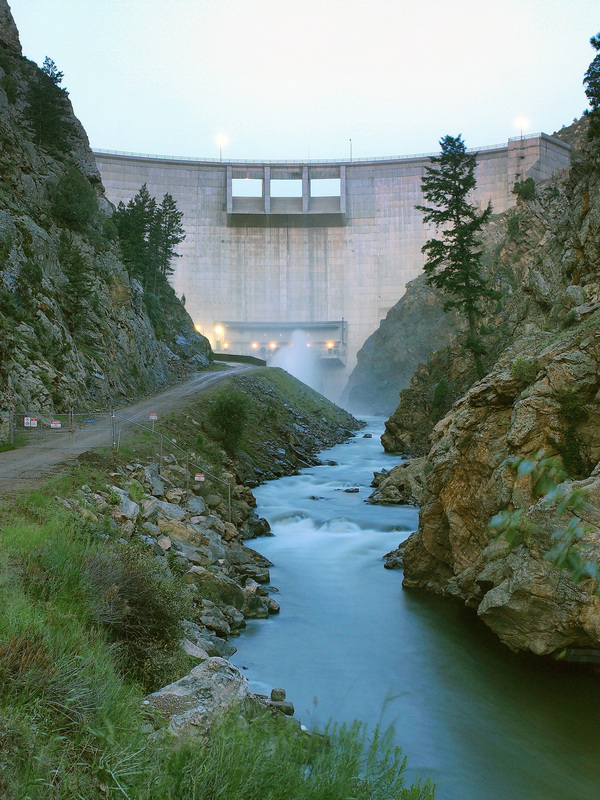 Completed in 1983, this dam rises 243 feet above the South Platte streambed. Waterton Canyon is home to many different types of wildlife, including the popular Rocky Mountain bighorn sheep herd. There are also mule deer, black bears, mountain lion(s), elk, lizards and snakes, including the prairie rattlesnake. 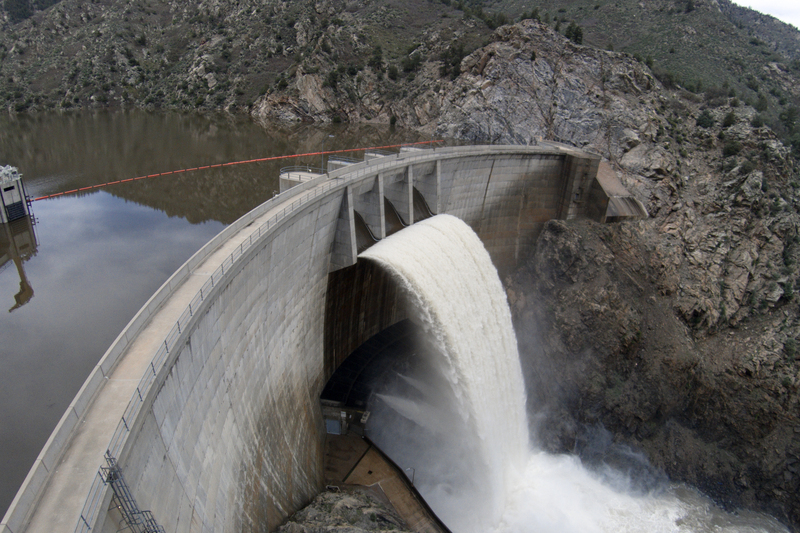 See Denver Water’s application for a small hydroelectric power project exemption from licensing. Fishing: The stream fishery is managed by Colorado Parks and Wildlife. For lake fishing, note that Strontia Springs is difficult to access from the Bear Creek Trail above Waterton or at the South Platte. Handicapped accessible fishing pier: A mile and a quarter up the canyon, the site was chosen for its mountain canyon stream location and access to fish habitat structures in the river. Handicapped persons have priority use. Biking: For the first 6.5 miles of trail, road bikes are suitable. Beyond the dam, mountain bikes are a must. Hiking: The canyon offers a 6.5-mile hike to the dam. The Colorado Trail continues above the reservoir about 10 miles to the confluence of the North Fork of the South Platte and the South Platte. The Colorado Trail continues to Durango. Waterton also connects to the Roxborough State Park system. Horseback riding: Waterton Canyon connects to the Chatfield State Parks trail system and the U.S. Forest Service Indian Creek system. Trailer parking is provided at Waterton and at the Discovery Pavilion. Wildlife viewing: Bighorn sheep and mule deer are often seen in the canyon, which also hosts more than 40 species of birds. To protect the bighorn sheep, dogs are not allowed on the canyon trails. Follow Wadsworth Boulevard (Highway 121) south of C-470 past Chatfield Reservoir. Turn left on Waterton Road. Take second entrance to the parking lot on the left. No dogs allowed in the canyon. Canyon accessible only by foot, bicycle or horseback. Prohibited: Canoeing, kayaking, tubing and rafting; water contact sports such as swimming, wading and scuba diving. ; camping and fires on the first 6.2 miles of the trail. Firearms and archery permitted only during open hunting season on U.S. Forest Service property. Permit required for special events or groups over 25. Requests must be received 30 days prior to the event. Not permitted on Strontia Springs Reservoir or on the South Platte River through Waterton Canyon. Permitted only on the Colorado Trail above Strontia Springs on U.S. Forest Service property. Check with Pike National Forest South Platte River District for restrictions. Waterton Canyon entrance to Marston Diversion Dam: Bag/possession limit for trout is four of any size. Bait is permitted. Marston Diversion to Strontia Springs: Bag/possession limit is two trout 16 inches or longer. Only artificial flies and lures may be used. Denver Water (owner, operator and recreation manager): 303-893-2444 or Customer Care Contact Form.